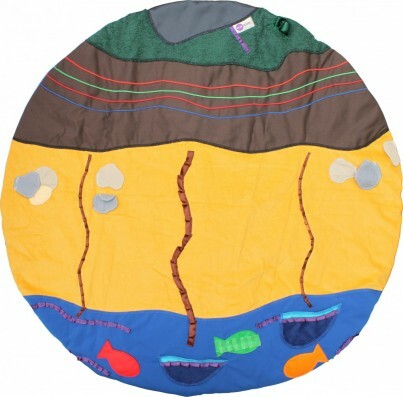 The gorgeous handmade Seaside Storymat (1m diameter) features rich detailing, contrasting fabrics and ribbon embellishment for providing maximum sensory feedback. 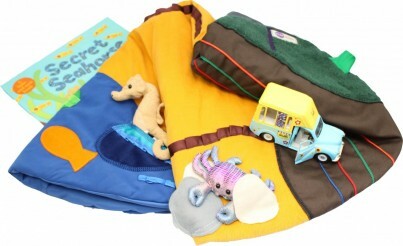 The ingenious pockets and flaps are perfect for introducing awe and wonder and surprise as well as sparking fabulous stories and imagination. Designed with just the right amount of detailing to inspire without prescribing, this wonderfully open-ended mat literally grows with a child. The cosy padding and waterproof backing ensure maximum flexibility as a play and sleep mat for newborns to a story-telling and imaginary world resource for much older children. Bring the mat to life with the enchanting Secret Seahorse story. The wonderful fabric-inspired images compliment the rich detailing on the mat and the cute seahorse puppet will delight. 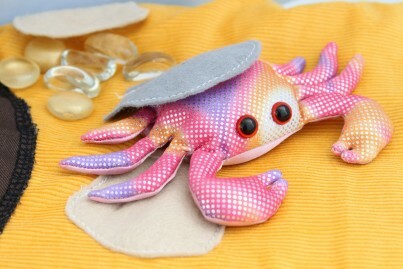 Take a trip down memory lane with the fabulously retro ice cream van and play hide and seek with the sand-filled crab.